MISSOULA, Mont. (AP) — A Montana homeowner was sentenced Thursday to 70 years in prison, with no parole for at least 20 years, in the shotgun killing of a German exchange student who was trespassing in his garage. District Judge Ed McLean said Markus Kaarma was hunting, not safeguarding his home when he shot 17-year-old Diren Dede early one April morning. "Here you have a 12-gauge shotgun, not to protect your family but to go after someone," the judge told Kaarma. "And go after someone you did." A Missoula jury convicted Kaarma, 30, of deliberate homicide in the case that caused an outcry in Germany and brought scrutiny to Montana's law allowing the use of deadly force in some situations to protect home and family. Kaarma faced between 10 to 100 years in prison. He shot Dede, who was unarmed, after being alerted by motion sensors in his garage. Witnesses said Kaarma fired at the teen four times, striking him twice. Dede's father, Celal Dede, said of the sentence: "It is justice. I am not happy. My son is dead." He and his wife attended the entire trial, and he flew back from Germany for Thursday's hearing. 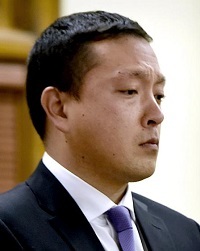 Kaarma sat staring down during much of the proceeding, occasionally glancing around the crowded courtroom. He sported buzz-cut, dark hair and an orange jail suit. "I'm sorry my actions caused the death of Mr. Dede," Kaarma told the judge. Before handing down the sentence, McLean heard testimony from Kaarma's girlfriend, a detective, the teen's host parents in Missoula and others. Kaarma's mother, Chong Kaarma, pleaded for leniency for the sake of her grandson, asking the judge to let the boy have his father as soon as possible. She apologized to Celal Dede from the stand. He replied from his front-row seat: "Why did you wait? Too late." Kaarma's girlfriend, Janelle Pflager, testified she has received death threats against her 19-month-old son with and Kaarma. She called Kaarma the "single-most misunderstood person I have ever met." "He didn't want to kill anyone," she said. "He only wanted to make sure he and myself and son were alive at the end." Missoula County Attorney Karla Painter later asked Pflager if she said during a phone call with Kaarma in jail that she and Kaarma wouldn't pay for the Dedes' "dirty rat son" to be sent back to Germany for burial. Pflager said she didn't recall saying that. Prosecutors argued Kaarma was intent on luring an intruder into his garage after it was burglarized at least once in the weeks before the shooting. Three witnesses testified they heard Kaarma say he'd been waiting up nights to shoot an intruder. On the night of the shooting, authorities said, Kaarma left his garage door partially open. He fired four shotgun blasts, pausing between the third and fourth shots, witnesses said. Lead detective Guy Baker testified that the first three shots were low and seemed to follow Dede as he moved across the garage. But the fourth shot was aimed higher and struck Dede in the head, Baker said. Kaarma's lawyers argued the Missoula man feared for his life, didn't know if the intruder was armed, and was on edge because of a previous burglary. Montana is among more than 30 states with expanded rights for residents to use deadly force to protect their homes or themselves, sometimes known as "stand your ground" laws. Kaarma said in court in December that he never intended to hurt anyone that night. His attorneys have said they will appeal to Montana's Supreme Court. Dede, from Hamburg, Germany, was studying at Missoula's Big Sky High School and planned to leave the U.S. after the school term ended a few weeks after the shooting. His parents testified earlier that they were unable to work or plan for the future after their son's death. Also Thursday, McLean rejected a request for a new trial from Kaarma's attorneys. They argued extensive news coverage of the shooting prevented the seating of an impartial jury. The case prompted one Missoula lawmaker to draft legislation that would require violent entry into an occupied structure for the use of force to be justified.